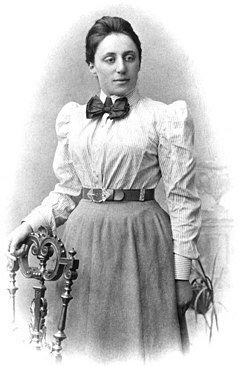 Emmy Noether (23 March 1882 – 14 April 1935) was born in the Bavarian town of Erlangen. Her father was the mathematician Max Noether and she studied Mathematics in the University of Erlangen where Max were teacher. She lectured her dissertation in 1907 under the supervision of Paul Gordan and after that she worked at the Mathematical Institute of Erlangen for seven years without any economical retribution! In 1915, David Hilbert invited her yo join him the Mathematics Department at the University of Gottingen. In that tiem, women were excluded from academic positions and she had to lecture her works under Hilbert’s name. Her habilitation was approved in 1919 and she became a leading member of the Department until 1933 when Germany’s Nazi government dismissed Jews from the university positions (she was Jewish!). She moved to USA where she lived until her death in 1935. Her contributions in abstract algebra were exposed by B. L. Van der Waerden in his influential 1931 textbook Moderne Algebra and her contributions were recognized around the world in the 1932 International Congress of Mathematicians in Zürich.